When you’re planning for an international trip from LAX, you’ll need to take several important considerations into account. TSA regulations require you to do a pre-flight security check, which includes dropping off your baggage. You might want to plan to be at the airport at least three hours prior to your flight, so book an airport shuttle that will run earlier to accommodate your group. A charter bus will help keep the group together, and everyone can arrange to meet at a parking structure or at a mutual location (such as the boss’s house). All your luggage will fit directly onto these buses, and each suitcase will safely arrive with you at your stop. A shuttle bus also has access to drop you off at a terminal, so your entire group can get off and be accounted for prior to boarding. Everyone goes through pre-flight checks at once, and all stick together. This is especially important for sports teams, as young kids quickly get lost in large airports like LAX. Minders should be with every group, to be sure everyone can navigate the airport and boarding procedures safely. Take a final headcount prior to boarding, and make sure everyone has boarding pass and passport in hand to be checked by flight attendants. Once you’re on the plane, depending on whether the flight is a red eye, you may find blankets and pillows. Sleep aids are useful for long flights, but the most useful piece of advice comes before you ever set foot inside the plane: book so that you arrive on regular hours. That means that if you have a twelve hour flight, book it such that landing will feel like time has passed and you’ll find your sleep cycle will be more natural throughout the trip. 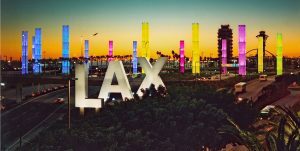 Pacific Coachways offers charter bus service to and from LAX International, for groups and schools. Book your trip with Pacific Coachways.